PORT OF SPAIN, Trinidad, Aug 30 2017 (IPS) - Conversations about renewable and sustainable energy don’t typically include artistic ideas on the subject. However, the Caribbean Community (Caricom) has chosen to engage the region’s youth in the conversation by inviting them to create artistic works on sustainable energy for a regional competition. Seven of the nine winners in the 2016 competition were from Trinidad and Tobago and in June they were honoured at a ceremony held by Trinidad and Tobago’s Ministry of Energy and Energy Industries. Sobers said her focus in painting “Mother Energy” was to encourage “sustaining the environment with the right motive, with a motive of loving it, cherishing it and benefiting from it." Some of those winners told IPS that the competition had indeed kindled their desire to be a part of the sustainable/renewable energy discussion now taking place in the region. Candice Sobers, who won second place in the professional art category, describes entering art competitions “as a hobby” because “exposure in the arts is difficult to come by in Trinidad”. Nevertheless, the research she did for the competition has had an impact on how she uses energy. She now turns off any lights and appliances in her home that are not in use, and she has invested in energy-saving light bulbs. 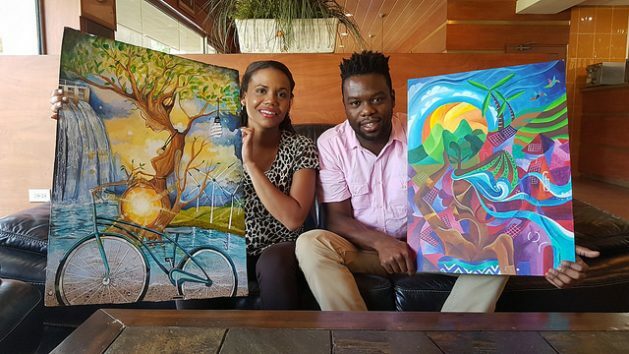 Sobers’ entry to the Caricom Energy Month art and photography competition depicted a tree painted in the shape of woman who is seen pregnant with the sun. The mother tree’s mode of transportation is a bicycle and the environment she inhabits comprises various forms of renewable energy. He explained that the hair of the woman, in a traditional corn row hairstyle, was also used to depict rows of plants while the palm trees seen in the landscape behind her also carried the implication of wind turbines. As one gazes at the painting, one’s eyes are led by the graceful lines of the woman’s arm and the undulating lines of cool blue and green depicting her hair to the warm, vividly coloured sun and mountains she carries in a basket on her head, with their obvious allusion to solar energy. In explaining his work, Thompson said. “I really wanted to connect sustainable energy with the elements of the Caribbean we all could relate to—sun, foliage, fauna, people, houses and hills.” The houses in his painting are shown with solar panels on their roofs. He said he has started a project at the school where he teaches art to promote the idea of sustainability. The project encourages Form 5 students to find objects that are discarded and repurpose them in ways that are beneficial and profitable. 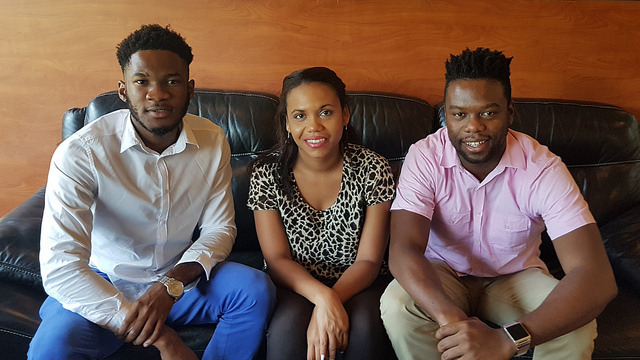 For 19-year-old Fidelis Iwueke, the first prize winner in the Caricom Energy Month video competition, his studies at A’Level in Environmental Science provided the foundation for his creation. Iwueke has just finished secondary school and his success in the video competition has awakened an interest in documentary production as a prospective career. “I am a former documentary junkie. I love documentaries,” he said. He is also a poet and spoken word artist, which made the video competition the most suitable category for him, he said. Using public domain footage and videos that he gained permission to use, Iwueke was able to create his award-winning video. He began by creating an audio track of his voice discussing the topic of sustainable energy, to which he added music. He then overlaid this on the video he had obtained, following which he edited the video using the WeVideo app on his phone. The result was a seamless production that belies the fact that this was his first foray into video production. The video then goes on to discuss why sustainable energy is important and the different forms that are available to Caribbean people and encourages their use, while holding viewers’ attention with arresting footage. Despite learning environmental science at school, preparing for the competition was a learning experience for him. “I liked and followed the Caricom Energy page to keep in the know. I learned how far the Caribbean has come and how much more we need to do,” he said. The competition thus provided an avenue for these young Caribbean artists to further their practice, while making them more invested in sustainable energy as a lifestyle. “Now that I am more aware of renewable energy, I will become more of an advocate in any way possible. And when the finances are there I will make better choices,” said Iwueke.